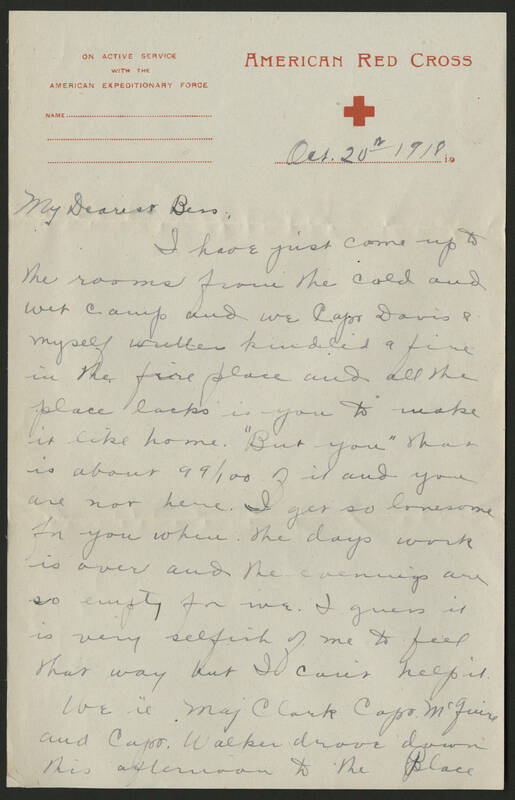 Oct. 20th 1918 My Dearest Bess I have just come up to the rooms from the cold and wet camps and we Capt Davis & myself kindled a fire in the fire place and all the place lacks is you to make it like home. "But you" that is about 99/100 of it and you are not here. I get so lonesome for you when the days work is over and the evenings are so empty for me. i guess it is very selfish of me to feel that way but I can't help it. We ie Maj Clark Capt McGuire and Capt. Walker drove down this afternoon to the Place.